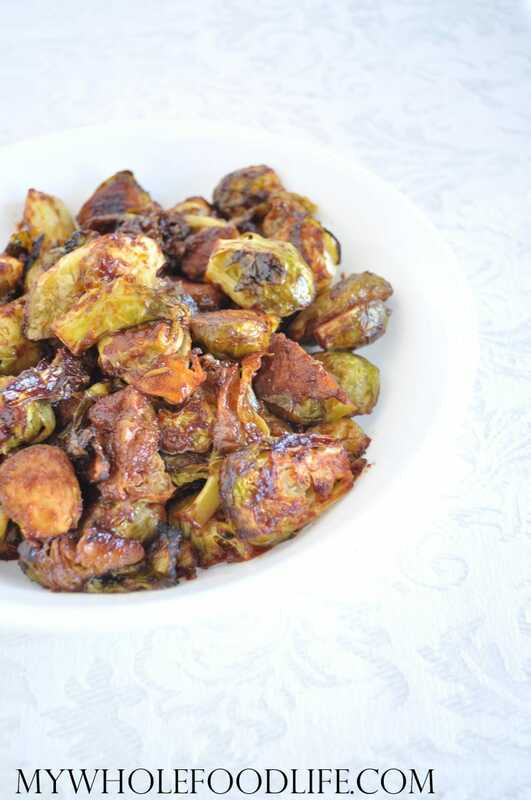 I made you guys some Tomato Roasted Brussels Sprouts! We have been staying with my in-laws during our home renovation. My mother in law turned me on to yet another delicious way to roast Brussels sprouts. This recipe is super easy and it uses ingredients you already have in your kitchen. These tomato roasted Brussels sprouts are great as a side dish, or you can serve them over quinoa for a complete meal. If you also love Brussels Sprouts, you will also like my maple glazed Brussels sprouts are my shaved Brussels sprouts salad with a lemon vinaigrette. These are seriously so good, I just eat them right off the tray! They don’t last long, so I suggest making a double batch. Remove the ends of the Brussels sprouts and cut them in half. Place them in a large bowl . Pour the contents of the small bowl over the Brussels sprouts and mix until everything is coated. Spread the Brussels sprouts onto a lined baking sheet . Bake for 15 minutes. Stop to flip them over, and bake for another 15 minutes. These should last at least 10 days in the fridge. Whoa-- those sound amazing. While it's awesome that they'd last 10 days in the fridge, there's no way they'd be around that long at my house. Roasted veggies, of any kind, are easy to devour! LOL! mine didn't even make it off the tray! haha! Wow! Just wow! My Dad famously hates 'fairy cabbages'- but even he will surely be won over with these! Haha! Fairy cabbages. That is cute! I love baked brussels sprouts, especially when they get crispy and delicious. I must try this recipe! I agree the crispy bits are the best!